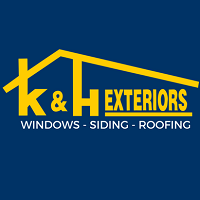 We provide complete Siding, Windows, Roofing, Gutters and Doors Services at affordable prices. Select from our many brands, styles, and colors we have to offer. For 50 years K&H Exteriors have been transforming neighborhood homes with pride. We Install Shingled Roofs, and Flat Roofs. We install high quality vinyl replacement windows: Bay and Bows, Garden windows, Double Hung Windows, Casement Windows, Slider Windows, Awning Windows, Picture Windows, Hopper Windows, and Transom Windows.